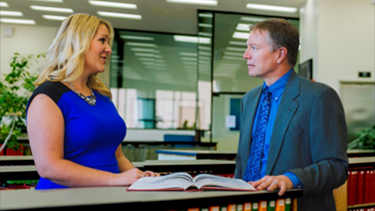 UNM Law has launched the Master of Studies in Law (MSL) program for mid-career professionals and recent college graduates who want to enhance their career with legal education relevant to their field or interests. The 30-credit degree can be earned in one year of full-time study or up to four years of part-time study. MSL students take courses at the law school relevant to their current or future jobs along with students pursuing their Juris Doctorate (J.D.). The program offers concentrations in Indian Law and in Natural Resources and Environmental Law. The new degree will help fill the growing need for non-attorneys with a working knowledge of the law in New Mexico. “Employers in federal, tribal, state and local government, the national labs, and private-sector fields are enthusiastic about the MSL degree because graduates will gain solid credentials and legal expertise,” says UNM School of Law Dean Alfred Mathewson. Competitive applicants will have strong academic records and/or substantial work experience. More information can be found at msl.unm.edu.